"Everyone keeps commenting on our lovely bathroom it has made a real difference to our lives, giving us that extra space that we so desperately needed Smiley Building Services made the whole process really easy from designing to installation. A really great job." "My wife and I would like to express our appreciation to all your hard work and efforts in our kitchen. I know that I can now speak confidently of their high standard of customer service, which is clearly a hallmark of the company. Highly Recommended." "The service was great and our bathroom looks brilliant. We have recommended Smiley Building Services to everyone we know!" "Polite, helpful, extremely courteous and very professional. That's how I would sum up Smiley Building Services and the work they have carried out. I cannot express my thanks enough." "Far to often we have come to expect to be disappointed or let down by companies in the home improvement sector, but Smiley Building Services breaks this mould and sets a standard of customer service and quality workmanship that others can only try to match." "Smiley Building services done the job quickly and for a reasonable price and smiley and Chris themselves were very nice and friendly. Thank you very much for your help and I will recommend your services." " Smiley Building Services replace two bathrooms in our new London house. As someone with an interest in design - and an opinion to go with it - I am not an easy client. Smiley and his team really delivered on the brief. More than that, they brought solutions that focused on quality and did the work properly rather than hastily. The team had high standards and they worked around our schedule, and returned promptly to complete any snagging. In a couple of words, they were professional and helpful. I would absolutely use Smiley Building Services again." " Smiley runs a highly professional and creative building company. He is able to visualise great ideas for a wide range of projects and his solutions are well thought through. He is sympathetic to work with and listened to my wishes while leading me in the right direction! He always makes a good case for his recommendations and is inevitably right about key decisions. More than interior design, Smiley ensures that your finished interior has the mood and ambiance to reflect the personality you want to project. He has completed two fabulous houses for me, and is a breath of fresh air." "When we bought our house, Smiley Building Services had a vision and encouraged us to open out the space. His special design and careful organisation meant that the job was completed with very low stress levels and the result was absolutely fantastic. Highly recommended!" "Very pleased with the prompt quote. Worked solidly the whole time till the work was done, and also made lots of effort to keep dust to a minimum, clearing up at the end. Worked within my budget and was able to work at a time suitable for me. I was pleased with the result, and would recommend them." "Smiley Building Services completed the job on time and true to their word at a very competitive price. The work was outstanding and I had no complaints. I would thoroughly recommend them to any of my friends. It was a pleasure to have such professional and articulate tradesmen working for me." 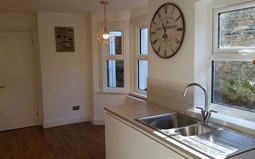 "We recently had full refurbishemnt done on our house and were very pleased with the excellent quality of the work carried out. The finish of the plastering, tiling and painting is of a very high standard, we would definitely recommend Smiley Building Services"
"Build an extension and converted to bathroom' - Bassem(Smiley)is very good and confident in his job and his happy to offer a profesinal advices. From the start to the finishing I do not have any problem with the him or with the his team. I recommend him very much to any one looking for clean reliable profresional tradsman. Thank you Smiley Building Services"
"Smiley (Bassem) was very professional from the beginning when he came over to do the initial quote right until he completed the job. The workmanship was excellent , quick, reliable hard worker. and very good value for money. The work was of a high standard very pleasant to deal with. Highly recommend, would definitely use again." "Now that the dust has settled and the decorating completed, we would like to take a moment to thank you and the team that carried out all the work to create our extension into a delightful new room. Throughout the program, the timeliness and courteous behaviour of the various tradesmen gave us confidence of a successful completion to a high standard of workmanship. 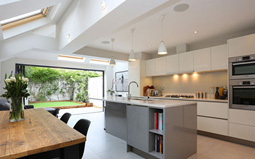 The structural design allowed an impressive use of the available space to give light and airy room together." "We just felt we had to write to you to say ‘thank you’ for doing such a wonderful job on our extension. Smiley and Chris were brilliant, from start to finish; everybody involved was extremely professional and very efficient. The extra space and en-suite is looking far better than we ever could have imagined. We would both certainly recommend Smiley Building Services to anybody in the future." "From the very first day we had you on site; we have been absolutely delighted with the work that has been carried out. Your guys have been professional from start to finish. They have been courteous at all times and have been immaculately tidy, trustworthy and have between them made what might otherwise have been quite a stressful time actually a real pleasure - i.e. seeing the progress that was made each day. The whole experience was a real pleasure for us. The end result has likewise exceeded our expectations... in fact, other people who've worked on the extension since (such as the decorators) have spontaneously commented on what an excellent job has been made. "I felt I must thank you for the fantastic job your lads have done on my loft conversion. It is absolutely beautiful. I cannot praise each and every one of them enough. Nothing was too much trouble for any of them, they were all so helpful, and at times very patient with my indecision of things! I will have no hesitation in recommending Smiley Building Services to anyone. They have done us proud and themselves proud." "Thank you so much to Smiley Building Services for a fantastic Extension. We are very impressed with the service we received, of course a big thank you to Smiley and Chriss for their hard work. Smiley was especially helpful and always discussed his plans with us, so we were always informed as to the progress of the room. He was very reliable and very sweet. We have no hesitation in recommending you to our friends. Thank you once again and happy new year." "We were delighted when we received our quote from Smiley Building Services , not only was it a brilliant competitive price but it also outlined our intentions for our conversion perfectly. At the end of the project our loft looked fantastic, it feels spacious and welcoming and they are highly recommended." 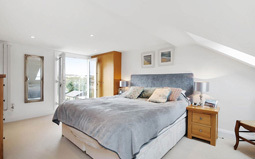 "We wanted to create a spacious room within our loft which would incorporate an en-suite bathroom, we felt this would not only improve our property but serve as a beautiful guest room for family and friends. We found Smiley Building Services and it was really helpful to discuss my requirements in depth. We found the quotation very reasonable and detailed, we went ahead and now our loft is finished. Smiley Building Services have given us exactly what we wanted and our loft space looks both spacious and inviting." "We are extremely pleased with our loft conversion, the workmen were friendly and reliable and the overall service from Smiley Building Services was excellent." "We decided to have the loft converted and as the property was being rented out to tenants we were on a tight budget. Smiley Building Services not only delivered a high standard of work, they also completed the project well within our budget. My partner and I are delighted with the service we received from Smiley." "We were quite certain we wanted to proceed with Smiley Building Services as soon as we received the quote. We can honestly say that we are so glad we did - our new garage conversion benefits everybody and is a great place to escape to after a hard day!" "Finally...A Building company that understands clients needs and supplies this without fuss or obligation! Thank-You Smiley Building Services "
"I found Smiley Building Services online and after viewing their web site and leaving my details there I was telephoned the next day. Their service was second to none and I have highly recommended them to my sister-in-law who is now in the process of receiving a quotation from them at present." "I thought Smiley Building Services had a really good, helpful website. Once Smiley had visited my home and explained the options that were open to me, I felt happy with what was discussed and decided to go ahead. My garage is now converted to an excellent standard." "Smiley Building Services converted our garage so efficiently we are now looking forward to 2006 with excitement after this fantastic extra space was added within our home. 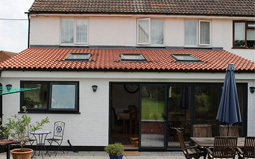 We would recommend Smiley Building Services to anyone considering a garage conversion." "Being a child nursing , I was concerned that the noise and disturbance I associated with having a garage conversion would make it difficult to carry on my job and have small children in the house. However, Smiley Building Services assured me that this would not be a problem and the noise and disturbance would be kept to an absolute minimum. They kept to their word and I continued with my job all the way through the work. The end result was really pleasing and erveryone has commented on what a lovely job Smiley Building Services have made of my garage. One of the children's parent's is now going ahead with a loft conversion with Smiley Building Services upon my recommendation."